When you think about RPGs, you usually think about rolling dice. From the humble, six-sided cube, to the iconic d20, to the absurd, hundred-sided Zocchihedron, there’s seemingly no end to the variety of dice out there. Their potential grows even further when you factor in dice pools, custom engraving, and all the myriad ways you can combine the results of different rolls to form unique probability curves. But I’m sick of dice. They’re everywhere, and while they work, they aren’t actually interesting. 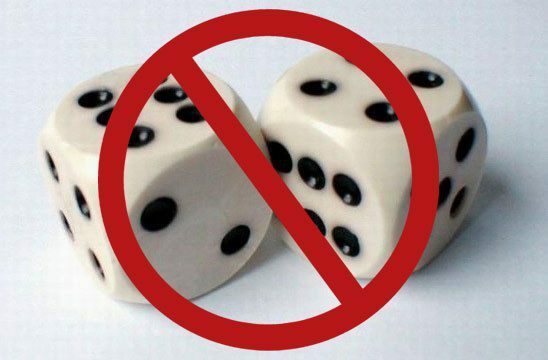 There are more ways to randomize outcomes than are dreamed of in your philosophy, Horatio, so let’s take a look at a few. And not simple substitutions like playing cards or spinners, either. We’re going into deep-indie-RPG territory, with five of the weirdest ways to randomize events. Dread is a horror RPG with a core mechanic that centers around a “block tower”—a non-trademarked way to say Jenga. If you’re unfamiliar with this game, Jenga is a tower of wooden blocks, and your goal is to remove blocks from the bottom levels of the tower and place them on top without knocking the tower over. It’s a fun-enough time-waster for ages six and up, but in Dread, you play Jenga for your life. Whenever your character needs to perform a dangerous task or confront a monster, the GM will ask you to make one or more pulls from the tower to see if you succeed. You can pass and not risk the peril of pulling blocks, but that might let your character fail or put them into a bad position. As in any game of Jenga, the first few block pulls are trivial, but soon the tower will get unstable. Therein lies the tension: if you knock over the tower, your character dies, goes mad, or gets removed from the game. No saving throws here. Not only does this tower perpetually raise the stakes, but it also creates a great visual effect. A wobbly tower is a reminder for the players that something is about to go terribly wrong, and they need to be sure of every choice they make. A collapsing tower comes with a satisfyingly loud clatter, underscoring just how doomed you are now. It’s not a perfect form of resolution—for one thing, it favors more dexterous players—but it works great for the genre. Dread doesn’t specify what the monsters must be like and doesn’t actually require a horror setting; one popular hack uses Dread to emulate a Mad Max: Fury Road car chase. What it requires is a setting where people are going into dangerous situations that most of them won’t come out of. The tower even contributes to the long-term pacing of the game. Once the tower falls, it gets rebuilt, and now all of the survivors get a little boost of adrenaline; the tower is a bit safer now, and they can afford to take more chances. For the moment, at least. Whereas Dread is a generic and adaptable horror game, Death’s Head starts with a specific, audience-alienating premise: the PCs are Nazi guards whose prison camp was overrun with zombies. This premise seems designed to shock the players, and whether the game uses the setting well enough to justify it is certainly up for debate. Luckily, it’s easy to move the action to a less-controversial setting, because the setting isn’t the most interesting part of the game. What’s interesting are the mechanics behind the zombie uprising. Death’s Head is literally a game of chess with the GM. Every character has a set of six traits with short descriptive sentences like “I was on the medical corps” or “I always follow orders.” Each trait is associated with a type of chess piece. Whenever your character takes an action, you have to move the piece associated with that trait. If you can’t move that piece, you can’t use that trait. What complicates things is the fact that two or three players, each with their own set of traits, are all moving the same pieces. If you want to move your knight, because that’s the best move at the moment, you need to come up with a narrative justification based on the trait attached to the knights. The game ends with checkmate, as the guards either subdue the undead or get overrun by them, so you need to make good moves. But they have to make narrative sense. And since multiple players are on the same board, every move threatens to ruin someone else’s strategy or get them into a position where they can’t use a trait they really need. While the moves aren’t strictly random, they can be too complex for most people to truly predict, making them almost random enough. The chessboard mirrors what it would be like to suffer an onslaught of the undead. It forces players to track many things at once and has them continually stepping on one another’s toes on an all-too-small board where resources are always dwindling. The GM, meanwhile, has no restrictions on what moves she can make and nobody else messing with her strategies. Against a halfway-talented GM, the players should feel overwhelmed. But that reveals a problem: while the potentially-troubling setting can be changed, the game really depends on the GM’s ability to play chess fairly well. In Warrior-Poet, the player characters are all warriors and, stay with me here, poets, living in the mythical, vaguely-Japanese Empire of the Moon. They travel the land, achieving greatness for themselves and their people, but when there is a conflict, they must duel. And dueling takes the form of poetry. Both sides write haiku describing the scene as the Warrior-Poets clash, and a third player determines which is the superior bit of verse. Admittedly, dice are still involved with Warrior-Poet. If the best haiku doesn’t win outright, it just translates into bonus dice for a dice pool. That said, with six bonus dice up for grabs, the power of your poetry directly impacts your ability to succeed. Lots of games can be praised for the elegance of their combat systems, but Warrior-Poet is uniquely beautiful. Whatever the nature of the duel, perhaps a physical confrontation, debate, or dance contest, you will emerge with a lovely little poem that describes it. Moreover, you create a record of the game as you go. The haiku get written down and form an extended log of all the battles and trials that the Warrior-Poets face. To some degree it’s even less fair than the above systems; games have objective win-or-lose conditions, but poetry is extremely subjective. Whomever the judge likes better has a much-improved chance of winning, although the changing judges and the dice pool tacked onto the poetry contest should smooth out rough edges. It is, however, an exceedingly thematic system. Rather than emulating a genre, the poetry repeatedly underscores a sense of place. While the Empire of the Moon is evoked in haiku, the rules suggest trying other forms of short verse to radically change the tone of the world. Limericks, for instance, would change the world from vaguely-Japanese to vaguely-Irish, without altering the ridiculous yet awesome process of dueling via poetry. Do: Pilgrims of the Flying Temple is a game about the magical initiates at the Flying Temple, who are out trying to make the world a better place. They help people and, in so doing, get themselves in trouble (and, if they’re lucky, back out of trouble). They do this with a sack of black or white stones. When players start a scene, they pull three random stones out of the bag. After seeing what stones they drew, players can choose to keep either the white or black ones. The color doesn’t matter for the scene, just the size of the set. The more stones you keep, the more heroic you are in the scene; keeping one stone, or even zero, means you get into serious trouble. Of course, since you can choose, why would anyone ever opt to keep the smaller set of stones? This is a Wuxia-inspired setting, and the game uses the stones to enforce the theme of maintaining balance. A successful pilgrim must maintain balance. The stones you keep stay in front of you, and when a player has eight or more stones, the game ends. Unfortunately, you have a whole set of goals that need to be accomplished in order to give the adventure a happy ending. So, the more heroic you are in the moment, then the more likely you are to hurry the game along and risk a negative ending. Meanwhile, the odds in the bag are in constant flux, because the stones you don’t pick are put back. If black stones keep being chosen, then it becomes more likely that players will draw an all-white set, forcing them to either fail at something by choosing the zero black stones or keep the all-white set and bring the game perilously close to ending without having helped those who need assistance. The color of the stones doesn’t affect your actions during the game, because both yin and yang are tools to achieve your ends. But it’s essential that the players balance the stones they are taking so that they can do what needs to be done without screwing over their companions and themselves in the future. Imbalances stack up over time and become dangerous. Furthermore, the stones you keep will affect your destiny at the end of the game. If you have mostly black stones, you will end up cast out of the Temple. If you have mostly white, you will be a monk, divorced from all worldly concerns. Keep a balance, and your destiny is in your own hands. In Bibliomancer, available to supporters of author Jackson Tegu’s Patreon, you play bibliomancers—that is to say, people who have learned the secrets of casting spells by reading books. Not ancient magical tomes, but any book at all. Grab any random book, whether it be a collection of poems, a car manual, or an embarrassingly bad story about dragons, and then go nuts casting spells to deal with all the little problems in your life. Spellcasting is simple. Say what you want to happen, then flip open your book to a random passage, and read it aloud. Someone at the table determines, based on the words you’ve read, what precisely happens. So if you want to curse an enemy, flip open your copy of Macbeth, read “Within this hour at most I will advise you where to plant yourselves,” and see what happens. In this case, it might seem reasonable enough that this spell turns your enemy into a plant, and now a massive tree is in the middle of the hallway and growing ever larger. Magic! In general, the more your random passage meshes with what you’re trying to do, the more effective your spell will be. Bibliomancer is not a serious game. In theory, the bibliomancers possess godlike power, but they are kept in check by how embarrassingly unpredictable and chaotic their magic is. Their book of magic guides the chaos as it unfolds, but things always get more complicated for the hapless bibliomancers. It helps that only one player gets to be a PC at a time; everyone else takes a GM role, purposefully complicating the bibliomancer’s life. The chaotic nature of magic naturally complements the tendency for everything to get worse at every opportunity. All of these games have a strong thematic tie between mechanics and fiction. Whether the mechanics emulate the mood that characters would be feeling or evoke themes of the setting, they’re deeply tied to what’s going on. Weird mechanics have a unique ability to reinforce the fiction by forcing you and your character to either feel the same tensions or even physically do the same actions. Die rolls are quick and unobtrusive, which is fine, but they’re also generic. This is great over a long-term campaign, where you’ll be making hundreds or thousands of rolls, so they need to be quick to perform and parse. But for one-shots or short-term play, using dice is missing an opportunity. Put your little cubes away, and do something new and weird. Two that I like, which don’t actually feature any randomization mechanics, are Kingdom and Microscope. Both by Ben Robbins of Lame Mage. Kingdom is a system that has an interesting mechanic for handling the politics around the governing of a community of any size. It works by splitting leadership into three roles: The first is power, who makes decisions for a community; the second is perspective, who decides the external consequences of those decisions; and the third is touchstone, who tells what the people of your community are feeling about the course of events. The split of power causes interesting conflicts with any type of political body, from a brutal galactic dictatorship to a present day school board. Touchstone could be especially powerful in a democratic setting as they could determine which way the next election would unfold. Microscope on the other hand is a collaborative world building game. It uses a form of fractal storytelling in which players get to establish events from varying levels of perspective. It also allows players to easily move through space and time in terms of whatever fits the story. This also leads to one of the strengths of this system. This mechanic explicitly prevents “nuking Atlantis,” in which a player, often vengefully, removes an element from the game completely. Because of the movement through time, it is always possible to go back to before that occurred and go on as if it hadn’t. Oddly enough, the two systems almost work for inverse play styles. Kingdom seems better suited to groups that are happily antagonistic and can enjoy power struggles without taking it personally, while Microscope is much more collaborative in general. Looking at this list, those are certainly interesting mechanics for certain types of stories. I especially like the idea of multiplayer chess, though I would almost certainly change the setting to something that isn’t repulsive(though on the upside, the pdf rules are at least free, so I don’t actually have to pay for it to see how it was done in order to steal the rules for a different setting). This could also be interesting as a large scale campaign mechanic(loosely similar to something like Burning Empires) in which smaller actions are carried out more conventionally with dice or card mechanics. I also rather like the idea of Jenga as a sucess with a cost mechanic, which could even potentially be used in addition to dice mechanics. It also seems like it would be interesting as a mechanic for a game like The Last Best Hope, which revolves around heroic scientists attempting to save the world from an impending disaster and heavily features the idea of the heroic sacrifice as is common in such movies. Thus knocking over the tower at the proper point could be an intentional strategy, allowing the rest of the team to continue on in relative safety after the reset. Thinking about this a bit, that last mechanic gives me an interesting idea. While I am not really a fan of magic in stories, as I vastly prefer technology, the bibliophile in me likes the idea of using randomly chosen passages in a book as a means to randomize the story. Mystic, which is primarily a GM emulator, has a randomness table with extremely generic descriptions that give a sense of randomness to the story. Combing these two ideas could be an extremely interesting means of adding randomness to a story. This could also potentially work with Microscope above. Roll a d(# of bookshelves that you currently have access to), then roll a d(#of books per shelf). Then roll a d500* to pick a page and begin reading randomly. The key is that you would have to have a good idea of the context of your existing story. This would also be amazingly fun to play in a random library in which you just pick a shelf at random(as unlike your own bookshelf, you likely have much less idea where anything is). You would also have to abandon any book that is potentially relevant to whatever you are writing. Thanks for unintentionally giving me an awesome idea. * any arbitrary number can be achieved with a d10 for the ones and tens place and a d(target tens or hundreds diget). If you need a lower number than whatever die you have, reroll any larger number. You would also need to subtract one from any die other than a d10 to the fact that only d10s have a zero.